Contemporary bayside beach house with recently appointed furnishings. Waterfront reserve location at Vincentia on Plantation Point immediately across the road from Jervis Bay & dog friendly beaches. Sit back & relax on our large sunny deck and enjoy the view, or cook up a storm in the fully equipped modern kitchen. After a long day of fun in the sun why not unwind by enjoying a glass of wine & watching a blue-ray/ DVD on one our LED screen TV's. WiFi is also available. Close to Hyams Beach, Huskisson & Booderee National Park. Large 3-way main bathroom incl double shower & vanity. Fully stocked utensils and cleaning disposables. Jervis Bay is a beaufitful location 2.5hrs from Sydney. 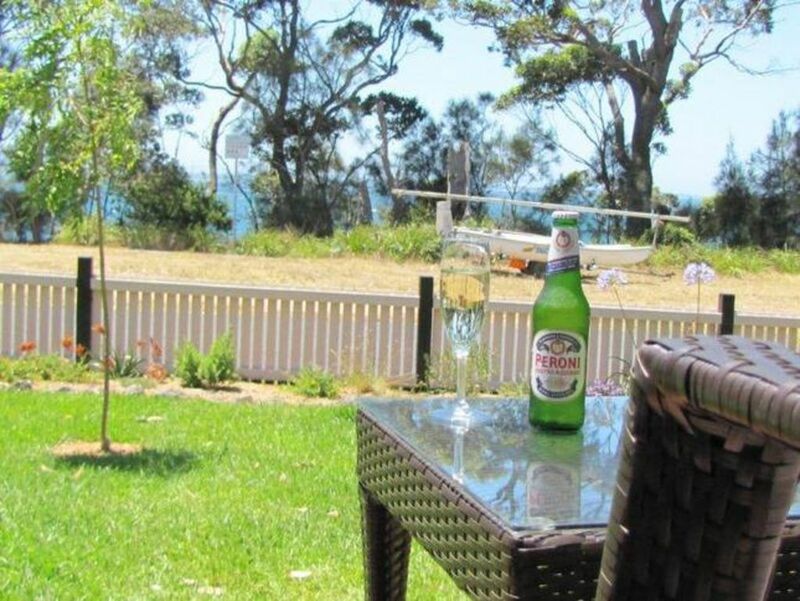 Great location across the road from dog friendly beach. We took our 2 schnauzers and had a ball. House is comfortable and clean with no issues. Would stay again. What a location! And the house was set up to be easily maintained for a beach holiday (no outside shower but hoses, back door entry into laundry, shady and sunny decks) and with the best equipped kitchen ever. We've stayed in many many Stayz houses (from luxurious to simple) but this had the most thoughtfully equipped kitchen of any. We'd booked so we could take our poodle but sadly he was in hospital and couldn't come. I always look at reviews to see how genuinely ''pet friendly'' a property is so thought I'd mention the truly pet friendly attidude of the owners, small but perfect grassed areas, well fenced block and tiled/timber effect floors which are easy to keep clean. This house is perfect for families and dogs. The house is totally baby proof, and with a dog and a one-year old we gave it a thorough test. The kitchen has everything you could want and the beach is just over the road with great opportunities for dog walking. I’ve been twice now and it’s the best house for a break and the neighbourhood Is peaceful. Thank you very much Katherine for taking the time to write such a great review. It's much appreciated. Location good.Well equipped kitchen. Plenty of car space. Good size washing line. Was disappointed with the amount of dog or cat hair on the floor, lounge and doona covers when we arrived. Had to wipe everything down. It you are paying for cleaners you need to do spot check and move the lounge you will be surprised what you will find under it. A vacuum cleaner would help better to get rid of the hair. Other wise enjoyable stay. Relaxed atmosphere with fabulous views and vibes. We stayed here for 3 nights for our son's wedding with some family and our dogs. It was lovely to come back here to the peace and quiet. Very well equipped kitchen and a nice relaxing vibe (for the furry family members too!). Jervis Bay is a beaufitful location 2-2.5hrs from Sydney.